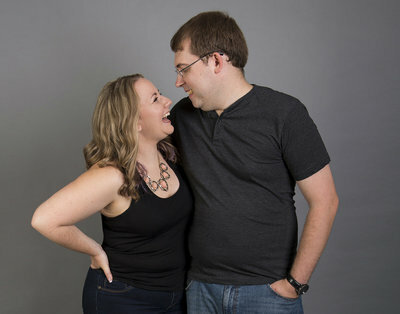 Scott & Kinzie are an absolute delight to be around. He is hilarious which is a perfect fit for Kinzie’s charismatic smile. It was a warm and sunny fall day and we couldn’t have asked for better weather. This wedding is jam-packed full of wonderful sweet details – our favorite! Our brides love to do a first look with their bridesmaids. And you can this image explains why. The moment of excitement, joy & happiness from all the anticipation leading up to this moment can be seen in the expressions of these ladies. They chose to do a first look, which was a perfect idea for their day. It gave them a chance to be together just the two of them before the hustle and bustle of the day began. Plus, the light was a dream. Kinzie made such an incredibly beautiful bride. The bold lip color was absolutely perfect! And Scott’s bowtie complimented the floras in her bouquet. This ceremony was an absolute blast, they wrote their own vows to one another full of detail, humor, & most importantly, love. Their officiant is a dear friend of theirs which made it all the more personable. 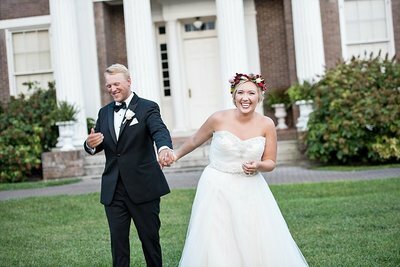 The recessional is one of our favorite moments from their day. The expressions on their families faces are so joyous! The bridesmaids designed and made their own bouquets. The flowers are stunning and the little detail of the ribbons was the perfect way to add a sweet finishing touch to the design. We’re so happy they chose a mix of bridesmaids dresses and they could not have been more complimentary. All of the shades of purple went together to nicely with the bouquets. All of the little detail elements that Kinzie & Scott added to their reception space really made it so personal. The stack of quilts they had readily available for guests in case it became chilly, the variety of centerpiece detail, & the sweet tribute to loved ones who have passed. The detail in Kinzie’s dress is so beautiful The lace, the beading, the delicate flow of the fabric. It was absolutely stunning! We were outside taking some night portraits and suddenly inspiration hit all of us together. We immediately realized we wanted to create a portrait inspired by the American Gothic painting. It is so fitting that these two have such energetic and fun friends, it fits their personalities perfectly. This is the first time we have ever seen an officiant get down on the dance floor like this & it was awesome! They celebrated their union by honeymooning in Orlando at Universal. How fun is that?! Such a beautiful wedding! Gorgeous light for the bride & groom pictures. And their rings are so gorgeous. Love how unique the rings were!! Thank you Christina! Everyone seriously adores their wedding rings. They are just so unique! All of these are beautiful photos but I’m obsessed with the rings!!! Do you happen to know who they are by? Seriously – these rings are GORGEOUS in person!!! Yes, we sure do! The grooms ring & her band were made by Staghead Designs. Holy Crap ! Beautiful photos and BEAUTIFUL Bride!! She is stinking stunning! Isn’t Kinzie absolutely gorgeous?! She is beautiful & looked phenomenal on her wedding day!! What a sweet wedding! I love their rings…and the door to their ceremony! So pretty! Their rings are gorgeous, no? The light is so beautiful!!! Nicely done! You captured this day beautifully! Thank you Jamie! It was a beautiful day in Murfreesboro. What a beautiful and fun looking wedding!!! Love her gold sparkly ballet flats! WOOOOW! Stunning!! That light is amazing! They look like such fun people! Their entire wedding was SO much fun — they were awesome, the wedding party was fabulous, & their family members were an absolute delight to be around! I just LOVE so much about this. The color palette and flowers, the golden hour portraits, and the love!! They chose the most incredible colors! We are still swooning over the golden hour light on their wedding day. Absolute perfection, right?! Thank you, it really was the perfect day!